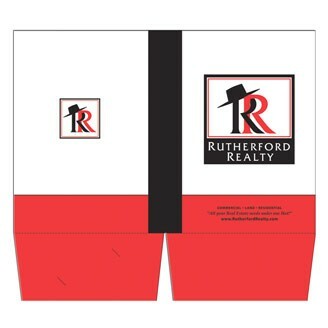 Presentation folder with two pockets and business card slits, 9" x 12". The right hand pocket has slits for inserting a business card. Heavy 14 pt. high density white paper board. Liquid laminated front for a high gloss finish and uncoated back. A high quality product for a large variety of business uses. Pockets are not glued to allow for expansion. PMS Color Match : $15.00(V) per color. Offset printed standard ink color no charge. Set Up : $35.00(V) per color, per side.